Every quilt, soft toy and home décor project is filled with love, warmth, comfort and pride. Mountain Mist offers a wide range of products designed with the quilter and crafter in mind. Discover the many options and broad selection available. All the Mountain Mist products are made with high quality fiber of unique blends both natural and synthetic, to meet the specific performance criteria and needs of each project. Download the Mountain Mist catalog here. Love styling your home with pillows? So does Mountain Mist. Transform any room with the simple addition of a pillow. We offer a variety of sizes and comfort with our Luxury Loft™, PillowLoft® and Designers’ Choice brands. These excellent pillowforms are available in a range of size from 8.5” square to 30” square. 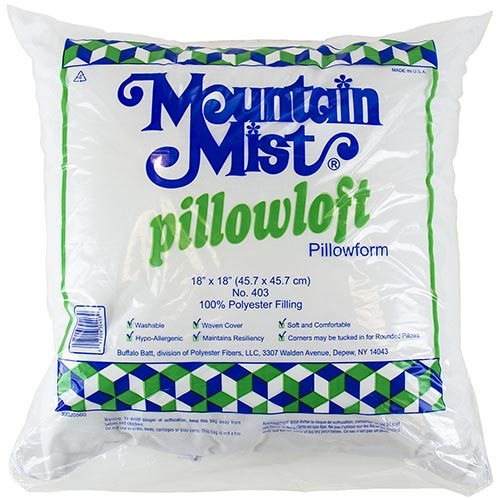 Quality Mountain Mist products are available wherever crafting supplies are sold.